In Full Moon Feast, Jessica Prentice guides us through 13 lunar months and the foods grown and prepared within them in traditional cultures. At its core is the idea that food connects people to one another, to themselves, and to the natural world. Prentice describes the lifecycle of Pacific salmon, who in early autumn are born in freshwater streams, spend their lives in the ocean, and then journey back upstream to their birthplace to spawn the next generation. The salmon’s natural lifecycle provides a metaphor for this time of year, when we are engrossed in our own “return.” On the High Holidays, we do teshuvah, which is often translated as “repentance,” but literally means “return.” We return to ourselves in order to examine who we are and who we want to be. For more Yom Kippur break-fast recipes, click here. 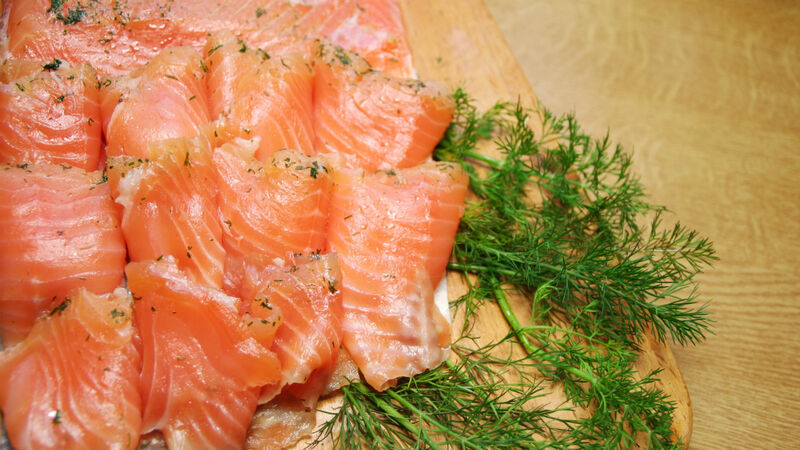 Eating lox this time of year connects our own process of “teshuvah” with salmon’s seasonal “return.” If you have never cured your own lox before, give this recipe a try, for Yom Kippur break-fast! It doesn’t require any special equipment, and is sure to delight. Thin slices of this buttery, moist gravlax will be delicious on your post-fast bagel or on a slice of homemade gluten-free challah. It tastes like no lox you have ever eaten before. In a bowl, combine the salt, sugar, peppercorns, and juniper berries. Line a glass dish that will fit your salmon fillet with two large pieces of plastic wrap and sprinkle half of your salt and sugar mixture onto the bottom. Lay half of your dill sprigs down, then cover with your salmon fillet. Sprinkle the remaining mixture on top of the fillet, then cover with the remaining sprigs of dill and your shots of alcohol, and then wrap everything as tightly as you can in the plastic. Leave it in the dish as the salt will create a brine for the fish. Refrigerate for 3-4 days, depending on the thickness of your filet. The lox is finished when the salmon’s hue has transitioned from pink to deep orange. Before serving, discard the dill and rinse the fillet of the brine, peppercorns, and juniper berries. Slice thinly against the grain with a sharp knife. Serve with sliced lemon and capers. Variation: try a layer of shredded raw beets on the non-skin side of your fillet before wrapping. After the lox is finished curing, each of your slices will have a purple or dark pink edge to it. Pronounced: yohm KIPP-er, also yohm kee-PORE, Origin: Hebrew, The Day of Atonement, the holiest day on the Jewish calendar and, with Rosh Hashanah, one of the High Holidays. Everyone loves a good bagel spread for most occasions, but especially to break the fast at the end of Yom Kippur. You don't need to live near a Jewish deli to get hot, toasty bialys, fresh from the oven.